How much is 11 + 13? How much is 20 + 14? Ask for reservations! Please contact us! The central La Cabana Hotel offers a storage room, a free private car park and a designated smoking area. 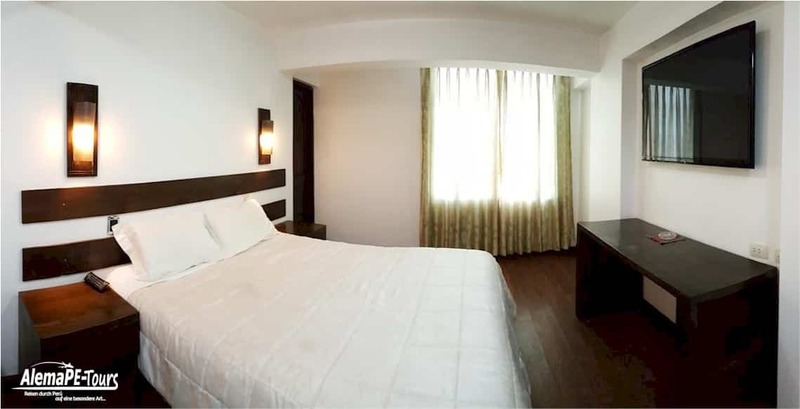 This hotel is situated 2.6 km away from Santo Domingo Church, Ausangate and Sacsayhuaman. The hotel comprises 21 rooms equipped with a patio, flat-screen TV, a dressing area, heating and a writing desk. They also comprise shared bathrooms appointed with a shower, a bathtub and a Jacuzzi. The hotel comprises 21 rooms equipped with a patio, flat-screen TV, a dressing area, heating and a writing desk. They also comprise shared bathrooms appointed with a shower, a bathtub and a Jacuzzi. Cars are available for rent at La Cabana Hotel. You may cancel free of charge until 1 day before arrival. You will be charged 50% of the total price if you cancel within 1 day before arrival. See our Terms and Conditions for more informations. Based on local tax laws, Peruvian citizens (and foreigners staying more than 59 days in Perú) must pay an additional fee of 18% .To be exempt from this 18% additional fee (IGV), a copy of the immigration card and passport must be presented. Foreign business travelers who require a printed invoice, will also be charged the additional 18% regardless of the length of their stay in Perú. This fee is not automatically calculated in the total costs for the reservation. How much is 7 + 8?